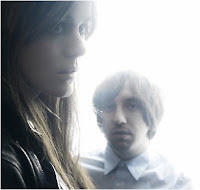 New Music Matters: The Hundred in the Hands' "Young Aren't Young"
I've been hearing a new song on KCRW with a familiar sound for the dance floor by a Brooklyn duo called The Hundred in the Hands, and quickly picked it for my Winter 2011 Playlist. "Young Aren't Young" has lush layers of synths, electric guitar and a female chorus of vocals -- I was surprised to see a live session by the band on WFUV's "The Alternate Side" where three people recreated the song in a small room. I also learned a new term used the interview when Eleanore Everdell and Jason Friedman discuss 'crate digging' though vinyl records in order to add to their collection. Whatever it takes for inspiration, I'm all ears. Here's my write up for PopMatters.com here.